Our May meetup will be 6 PM on Wednesday, May 15th at the Whole Foods dining/meeting area at Ray Rd. & the 101. Note the new location (Whole Foods) and the new date (the 3rd Wednesday instead of the 2nd). 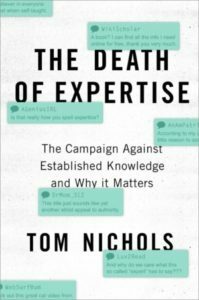 We will discuss The Death of Expertise: The Campaign against Established Knowledge and Why it Matters by Tomas Nichols. We decided to try this book because it was on the list of 5 Books That Explain Why It Seems The World is So F*cked and because it looked interesting. It’s sure to be a fascinating discussion! For future meetups, please check out our list of upcoming books.